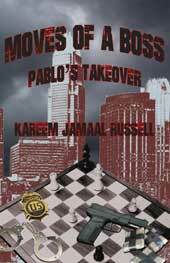 Y42K Publishing Services is pleased to announce that Moves of a Boss: Pablo’s Takeover by Kareem Jamaal Russell is out now in paperback and Kindle editions, and will be available soon through other ebook vendors. Chess is a game of capture. Life is a game of survival. Will Pablo be captured or will he be able to survive his game? Pablo is a certified gangster/hustler who’s trying to go legit, but his loyalty to the game is preventing him from fully letting go. He meets a woman named Red who has risen from the streets and has vowed never to return to the life she left behind. That was until she met Pablo and realized that his lifestyle might threaten the very vow she made to herself. People are playing both sides of the board… deception and betrayal are brewing, envy is rising, and bodies are falling. Will Pablo make the right moves or will the wrong moves cost him everything?